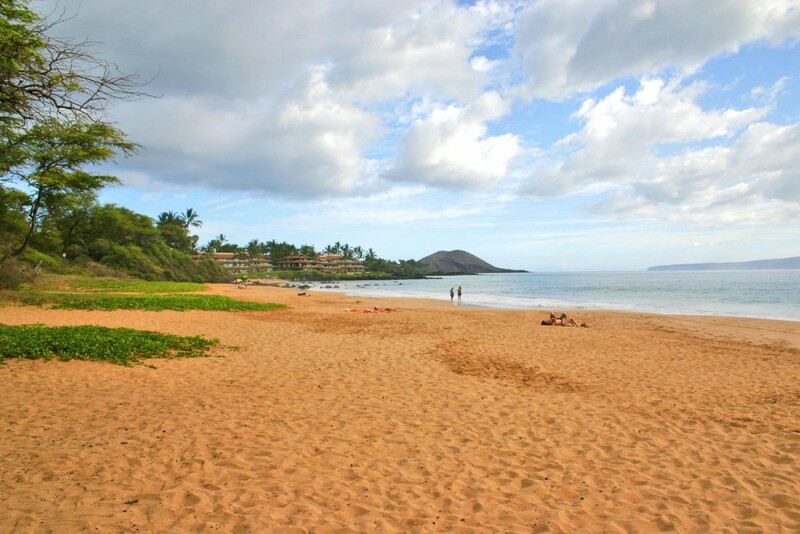 A long, often uncrowded sandy beach. In a nutshell: A long, often uncrowded sandy beach. Minuses: Has become more popular in recent years. Also known as Paipu Beach, Po’olenalena is a nice, long sandy beach, that until recent years was mostly known only by locals. Because it has spectacular sunset views, and often becomes uncrowded late in the day, it is a favorite location for wedding photographers and ceremonies. Po’olenalena means “yellow head” and is said to refer to a longtime landmark, a yellow-streaked rock on the golf course mauka the roadside. Mostly popular with local families, during the week it is less crowded. To read other guidebooks you’ll think you’re going to end up all alone on a spectacular deserted beach all day long – but you’ll need to come during the week early or late in the day for that. The main parking lot is big, but on weekends you’ll often have a tough time finding a spot to park. The south end of this beach fronts the Makena Surf Condos, and the north end fronts several high-end houses located on on Makena Rd. The central portion of the beach, directly off of the main parking area, is currently undeveloped and is popular with locals, families and fishermen. Snorkeling is excellent around the rocky outcroppings at the south end of the beach. Boogie boarding is also decent during south swells and perfect for kiddies or beginners when seas are calm. The sandy bottom entry is sloped gently for pleasant swimming and playing. Note: During Kona storms or large swells the ocean here can become unsafe with rip currents. There is a port-a-potty at the north parking lot and a shower at the south entry. Facilities: Port-a-potty, shower, no lifeguards. we were married on this beautiful beach and looking forward to returning. We loved this beach and the lava trails we had to go on to cross over to all three beaches. It’s beautiful!